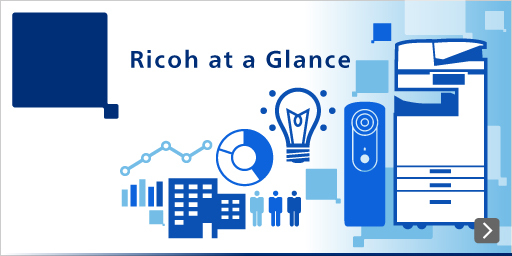 Here we provide answers to frequently asked questions about research and development at Ricoh. Q1.How much does Ricoh invest in R&D each year? Q2.Please describe the research structure at Ricoh. Q3.How is Ricoh involved with environmental technologies? Q4.Does Ricoh offer research center tours? Q5.How many patents does Ricoh have? Q6.Does Ricoh engage in joint research with universities, external research organizations, or other companies? Q1. How much does Ricoh invest in R&D each year? A1.In the fiscal year ended March 31, 2016 (fiscal 2015), R&D investment on a consolidated basis was ¥118,500 million, or 5.4% of net sales. Its 13.5%, ¥16,000 million was for fundamental R&D activities. Q2. Please describe the research structure at Ricoh. A2.Ricoh has set up research and development sites around the world including Japan, the United States, India and China. These sites are actively engaged in group-wide R&D activities, from technological research at the seed level, to R&D concerning component technologies and practical development with a view to commercialization. The R&D Group at HQ in Japan governs global R&D activities and in Japan we conduct research and development of core technologies that contributes to Ricoh’s main business area and new business opportunities. Our research covers wide range from basic areas including materials, simulation, analysis, optical design, communications, and devices to applied areas in environmental technologies, office systems, solutions, software, and other sectors. In the United States, Ricoh enjoys the benefits of Silicon Valley as a location for innovative research and development to create new business opportunities. In India, Ricoh established a research company focusing on advanced IT in 2012, where they create new IT solutions on site to meet specific local needs. In China, we engage in R&D in Beijing to take advantage of a wealth of excellent R&D personnel. Q3. How is Ricoh involved with environmental technologies? A3.Ricoh has designated environmental technologies as a high-priority R&D area and actively engages in environmental R&D. Ricoh contributes to the realization of a sustainable society by developing technologies from three perspectives to reduce environmental impact at every stage of product life cycles: energy conservation and global warming mitigation, materials conservation and recycling, and pollution prevention. Q4. Does Ricoh offer research center tours? A4.Ricoh does not open the research centers to the general public. Q5. How many patents does Ricoh have? A5.We work to acquire and exploit intellectual property to develop and protect our business, while encouraging the creation of valuable intellectual property. A6.Ricoh engages in many joint research projects in Japan and overseas with universities and other specialized research organizations as well as with other companies. To cope with a rapidly changing market environment, it is important to accelerate activities by collaborating with research organizations that offer complementary capabilities and strengths rather than keep all R&D activities in-house. In January 2013, Ricoh agreed with the Indian Institute of Technology Gandhinagar to endow the Design and Innovation Centre and become an industry partner aiming at the promotion of	Open Innovation in a major emerging country. Please read our news release on this.